Maltodextrin, Whey Protein Blend (Whey Protein Concentrate, Whey Protein Isolate, Whey Protein Hydrolysate), Dextrose, Cocoa Processed with Alkali, Natural and Artificial Flavors, L-Glutamine, Inulin, Soy and/or Sunflower Lecithin, Gum Blend (Cellulose Gum, Xanthan Gum, Carrageenan), Salt, Oat Bran, Quinoa, Aminogen®* (proteases), Lactase, Sucralose, Acesulfame Potassium. Before consuming STACKED PROTEIN® GAINER, seek advice from a physician if you are unaware of your current health condition, have any pre-existing medical condition, taking any medication, planning any medical procedure, contemplating pregnancy, pregnant or nursing. Reduce or discontinue use if any adverse reactions occur such as but not limited to gastrointestinal discomfort. STACKED PROTEIN® GAINER is only intended to be consumed by healthy adults 18 years of age and older. Keep out of reach of children and pets. Store at room temperature. Notice: Use this product as a food supplement only. Do not use for weight reduction. Maltodextrin, Whey Protein Blend (Whey Protein Concentrate, Whey Protein Isolate, Whey Protein Hydrolysate), Dextrose, Natural and Artificial Flavors, L-Glutamine, Inulin, Soy and/or Sunflower Lecithin, Gum Blend (Cellulose Gum, Xanthan Gum, Carrageenan), Salt, Oat Bran, Quinoa, Sucralose, Acesulfame Potassium, Aminogen®* (proteases), Lactase. Superior quality now comes with superior taste! Our flavor experts ensured you'll enjoy Stacked Protein Gainer’s taste as much as your results. 50g of the highest quality fast, medium and slow release protein from 5 sources providing 10g of Glutamine, and 12g of BCAA per serving are found in Stacked Protein Gainer. 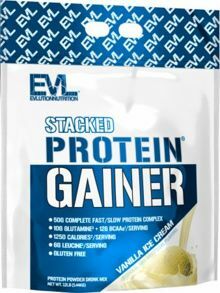 Stacked Protein Gainer combines the highest quality protein available with the highest quality carbohydrates to help build muscle.